Detel, known for economical feature phone has launched today two ‘true-capacity’ power banks and two car chargers. The two power banks are Detel Style and Swag which come with 10,000mAh capacity and are priced at Rs. 799 each. On the other hand, the DC24 and DC34 car chargers are priced at Rs. 299 and Rs. 399 respectively. These devices are available for purchase on Detel’s Website, B2BAdda, & major offline distributors. Detel’s car chargers are compatibile with most of the cars. These car chargers are fitted with smart safety systems that protect the gadgets from over current, overcharging and overheating. They come with 3 USB ports each, enabling one to charge multiple devices at a time. The USB output current of the DC24 and DC34 as per the specifications is 2.4A and 3.4A respectively. 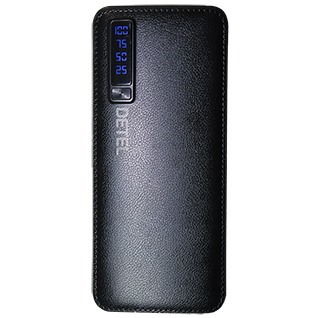 The Detel Swag powerbank comes with a leather look and a digital display as shown in above image. Both Swag and Style have compact exterior. These two powerrbanks are compatible with all iOS, Android & other USB-powered devices. The power-banks come with three USB 2.0 ports each, quick charge support, 9-layer circuit chip protection, and 1-year manufacturer warranty. The two devices also feature LED indicators and Torch. For device safety system, these power-banks are claimed to be manufactured with multiple safety protection systems. The new range goes through stringent quality testing with meticulous inspection at each stage as stated by the company.